While nature has been testing Moscow's stadiums and forcing the best soccer teams to play outside the capital, sports officials say there will be no problems with preparations for the 2018 World Championship. 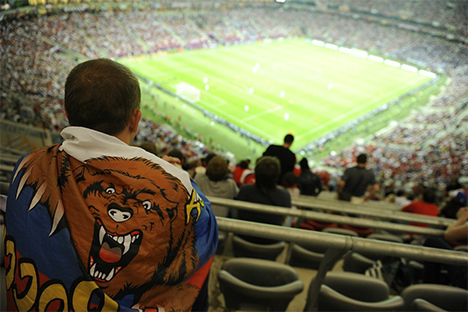 On Oct. 6, a truly historic local match took place: Moscow's CSKA against Dynamo (0:2). Usually, around 30,000-35,000 fans attend these kind of matches; this time, there were only around 6,000 spectators. This was due to the low level of CSKA's performance: Lately, the team has not been able even to penetrate and get close to their opponents’ nets. As for Dynamo, its achievements have become even more significant under the guidance of their new billionaire president, Boris Rotenberg. The fact is that Moscow's soccer matches have been taking place on a reserve field of the Lokomotiv Stadium, with synthetic grass of a truly bad quality. A rainy fall in Moscow and the unpreparedness of Russian soccer managers for this kind of series of events have turned Russia's championship into a truly pitiful sight. In Moscow—a city famous for its size—there are only two soccer stadiums that can be played in and no game covers on which you can hold matches at least a few times a week. The managers of the Premier League, having discovered that Moscow’s Spartak cannot find a place to play against Grozny's Terek, decided to send the two teams to Yekaterinburg. It is more than 1,056 miles from Moscow to the Urals capital, but, even so, this is where Spartak is set to play its match. Spartak, wanting to feel some support during their game, has offered its fans an interesting option. All holders of red-and-white game passes will be able to take a prepaid bus to Yekaterinburg to attend games; this is approximately three weekdays on the road, however. Even the most passionate fans will not approve of this. CSKA is also holding UEFA Champion League matches in another city—St. Petersburg. It is easier and faster to get there than to Yekaterinburg, but, unfortunately, a serious adversary resides there—Zenit. UEFA has made advances and has allowed Russia to hold matches on the Petrovskiy Stadium without an interval of even one day. On Tuesday, Zenit is set to play, and, on Wednesday, the grass of Petrovskiy will be "ruined" by the CSKA and Czech Victoria soccer players. Moscow's Dynamo will have their league play in the absolutely worst stadium of the championship—on the 3,000- seat Rodina Stadium in Khimki, on which usually only amateur teams play. Meanwhile, Luzhniki Stadium, which has saved Russia many times under similar circumstances, is closed for reconstruction. Five years until the 2018 World Championship, and there are no high-quality soccer stadiums in Russia. The general constructor of Zenit's new arena might once again be changed, the construction of the VTB-Dynamo Stadium has been postponed, and the Krasnodar soccer region, which has two soccer clubs in the Russian Premier League, will not be included in the final entry. At the same time, Russian soccer officials encourage fans not to panic. Vice president of the Russian Football Premier League, Sergei Cheban, is confident that all stadiums said to be ready in time for the World Championship will, in fact, meet the project schedule. According to him, the VTB-Arena will be completed in October 2017, and Zenit-Arena will be ready by July 2016; many cities will be ready for the World Championship as soon as next year.